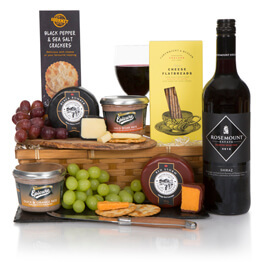 Discover a great value yet always well received wine and cheese hamper. 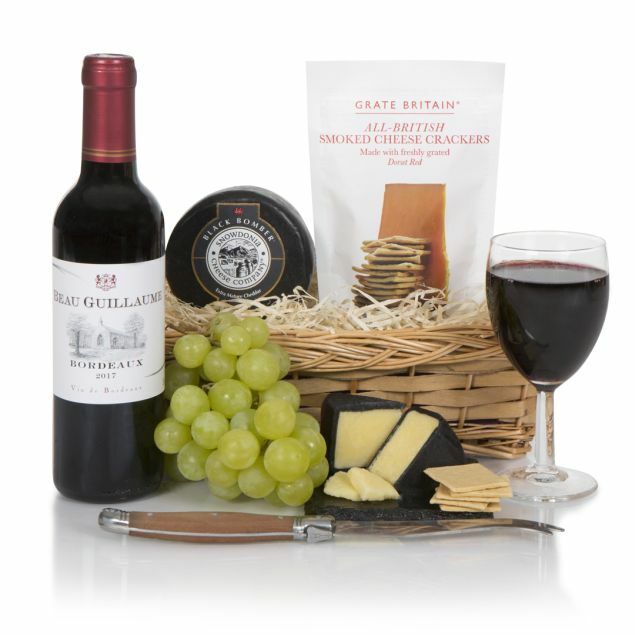 Fine Bordeaux red wine perfectly partnered with delicious Wensleydale cheese, smoked cheddar wedge and Highland oatcakes presented on a willow basket tray. Ideal for any occasion. I regularly use this company as I live in Australia and my family live in the UK. 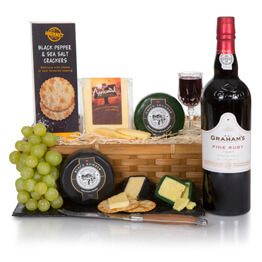 Reports from the UK is that the hampers are always of extremely top quality, very well presented and always on time. It is very reassuring to know that this is a very dependable service with products of quality. Received on time and recipients were pleased and grateful for the contents. This is the second hamper that I have sent to a friend, their response was they were delighted with the hamper on both occasions they were thrilled to get another one this Christmas. 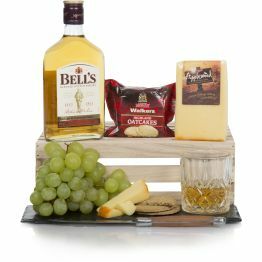 So although I have not tried it I can fully recommend on my friends response that this hamper is good quality and reasonably priced. Would definitely recommend this product and the company. Didn't actually see the hamper before it was sent - but the person who received it was very happy! The actual process of delivery arrangements was very professional and I would definetly recommend them. I brought this online for a friend who is living in the UK and she was so happy with what was delivered. 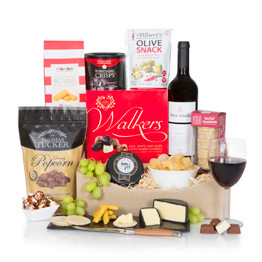 We have sent various hampers to say 'Thank You' to someone who has helped us solve a problem and they have been delighted....I was pleased with the efficiency and the quality. Now, I just need someone to think of sending one to me! I ordered this for some good friends and although I didn't see the actual product, my friends were very pleased with it. Very happy once again, ordered from Australia to UK. Easy to order any queries were promptly replied to and my Aunt loved the cheese and wine hamper! In time including a short delivery time. This was a gift for a special friend, it arrived in tact and on time. The receive was very happy with gift and will enjoy the contents. I was very pleased with the service of this hamper. Delivery was on time and the cheese and wine were delicious. Very pleased with selection, ease of ordering (from USA), good communications, timely delivery (to UK), and quality of presentation and goods. I purchased 2 hampers and this was my first time using Hamper.com. 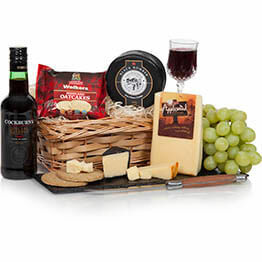 My brother enjoyed his cheese and wine hamper and my other family member got wine for his birthday. Both loved the surprise and the content. I would use this idea again as it's affordable and makes a lovely change from getting bills delivered!!! I paid for this in America, and it arrived exactly when I wanted it to for my boyfriend in England! 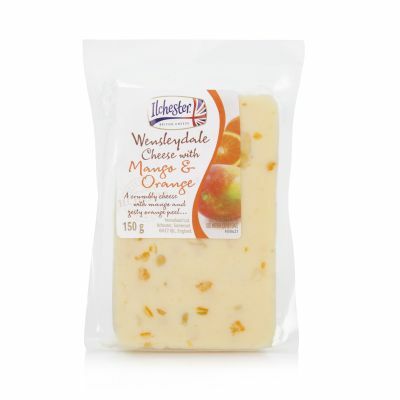 He loved it, and said the cheese was excellent. A perfect gift to say both Merry Christmas and thank you to friends, we will definitely choose this gift idea again! Recipient extremely pleased with hamper. I was impressed by the prompt delivery (at 2 day's notice) and that I was emailed about the hamper's progress. I will definitely use this co. again. I sent this as a gift - my stepmother was thrilled with it, the packaging and contents were by all accounts fabulous - thank you! This was a Christmas gift for my sister and brother-in-law in France. They were delighted by the contents. Many thanks. I must admit that being in another Country I did not actually see the hamper, but my Uncle showed me the contents on skype and all I can say is that he was thrilled with it. 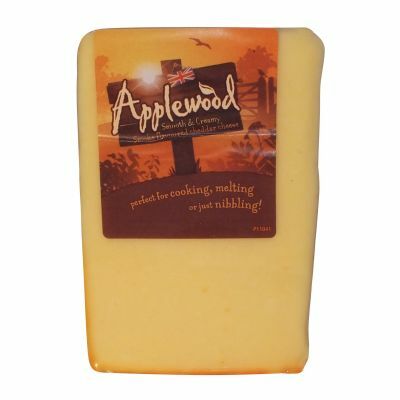 It appeared to be good value for money, the wine was of good quality (according to my Uncle) and the cheese was, so I am informed, was beautiful. 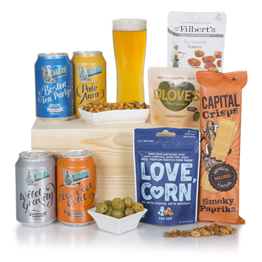 I have used this company on a couple of occasions now and they are my "go to gift hamper company" whenever I should need one. I have never bought a hamper for someone before, so it is hard to compare to other products, but I sent this to my boyfriend and he enjoyed it! I think it is great for one or two people. 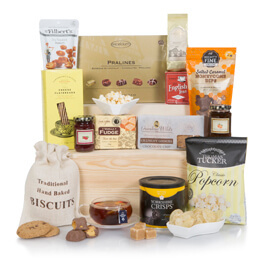 I sent this hamper as an anniversary gift & the recipients were very pleased with it. Our friends were so please with the hamper. It was the second year running we sent to them. We are considering ordering for ourselves next year! The quality of the content was very good, perfect for their tastes. 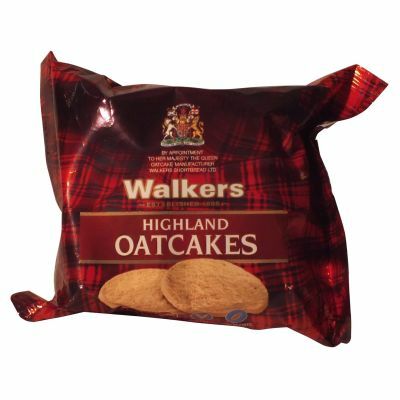 Great products, excellent service, dependable delivery, been using Hamper.com for many years to send gifts to friends in the UK.I have never been disappointed with either the product or the service, will continue to use them . They are affordable. 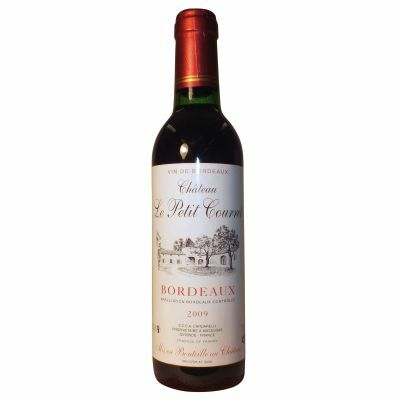 The hamper was received on time and had favourable comments from receiver. This was a gift for my aunt. She said it arrived beautifully packed and that the contents were great. I then ordered a basket for my father. Great little hamper, wine was bigger than I realised. Both recipients were really happy with it, would recommend.